Next week I go up to Norfolk for the rest of the summer and I am starting to think about what work and materials I need to take up with me. I tend to take just the things required for the projects I have on the go at the time (and a few essentials I can’t do without). The process of thinking about what I need to get done over the next few weeks has made me realise that it amounts to rather a lot! I thought you might be interested in all the ends I need to tie together before the autumn. 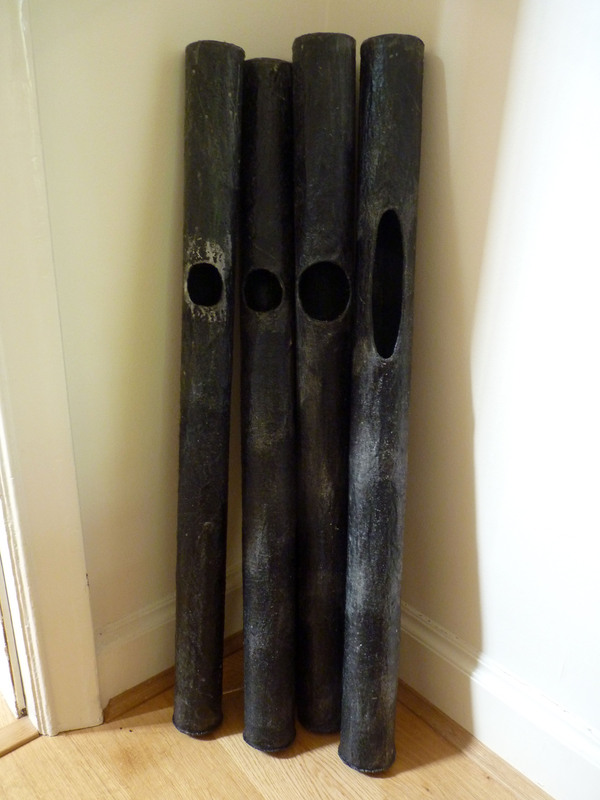 Firstly, my Aeolian Pipes. Well – I’ve made four new large ones. As these are an experiment I am trying out one aspect of their design at a time to see how I could get them to sound out in the wind. 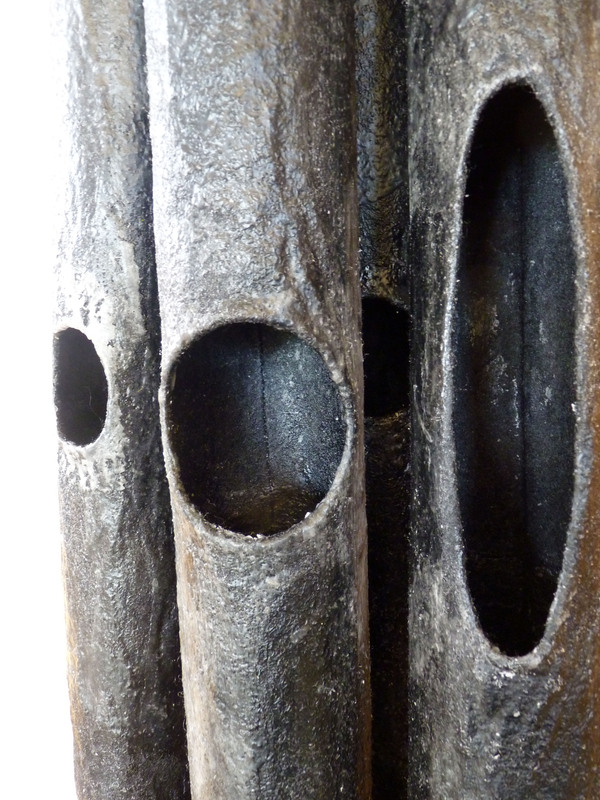 For this series of ‘trying outs ‘I have changed the shape of the hole in the side. I know from my flute playing days that the shape and size of the embouchure hole effects the type of sound the instrument produces, so it makes sense to start with that. I have incorporated small, medium and large round(ish) holes and one long thin hole. It’s fingers crossed that they make a noise …. I’ll let you know when I get them on the beach in a good wind. 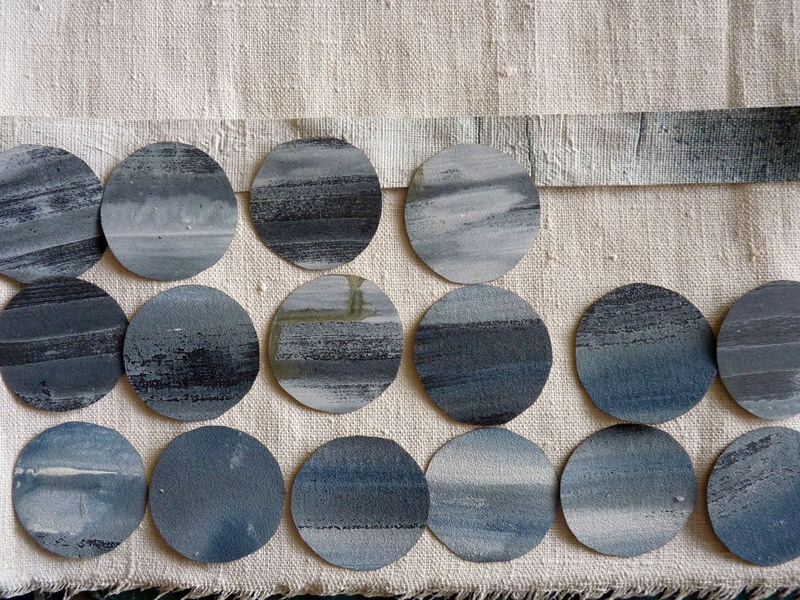 Secondly, I have a piece to make for Studio 21. All year the group have been drawing, painting and generally getting together ideas to kick-start a project that started with some old sewing machines that we abused and pulled apart. I have to say that the idea of making work simply from drawing an old sewing machine didn’t really inspire me but after a bit of thinking things are beginning to fall into place. I am revisiting a piece from the Marking Time project that I exhibited last year at the Crypt Gallery. 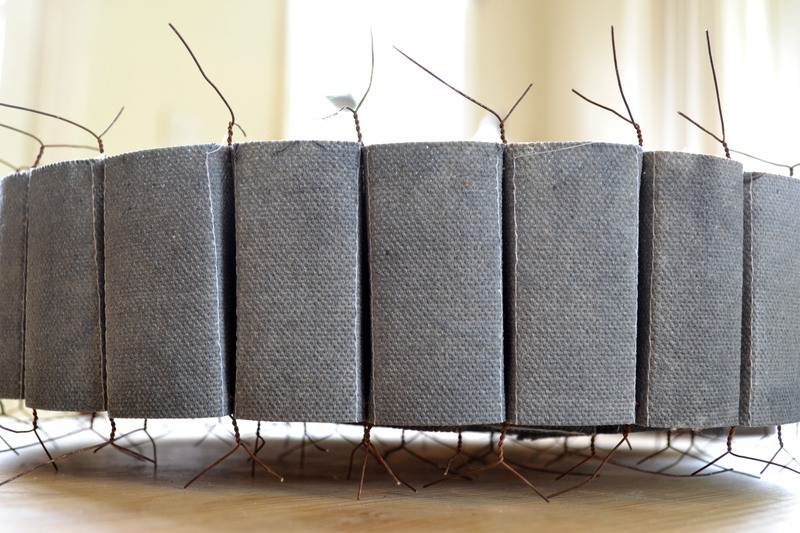 One piece, Counting Cloth – Beating Time, I always felt would work well as a 3-D installation made up of many identical (or nearly identical) units that tick-tocked their way across the floor and up the wall. The connection to a sewing machine is in the repetitive and rhythmic sound of the motor and the visual action of the needle and bobbin. Here is the first one …. …. just another 20 odd to make. While we’re talking about Studio 21 you may be interested to know that the group are currently looking for new members. 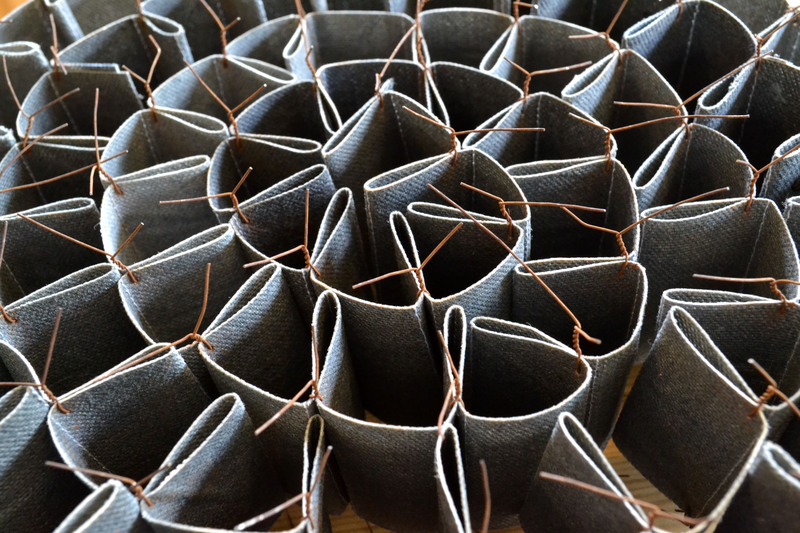 If you can get to meetings in Surrey and have a ‘strong personal style, exceptional skills in making and an excellent knowledge of your chosen materials’ why not put in an application – we would love to hear from you. Application form here. Thirdly …. 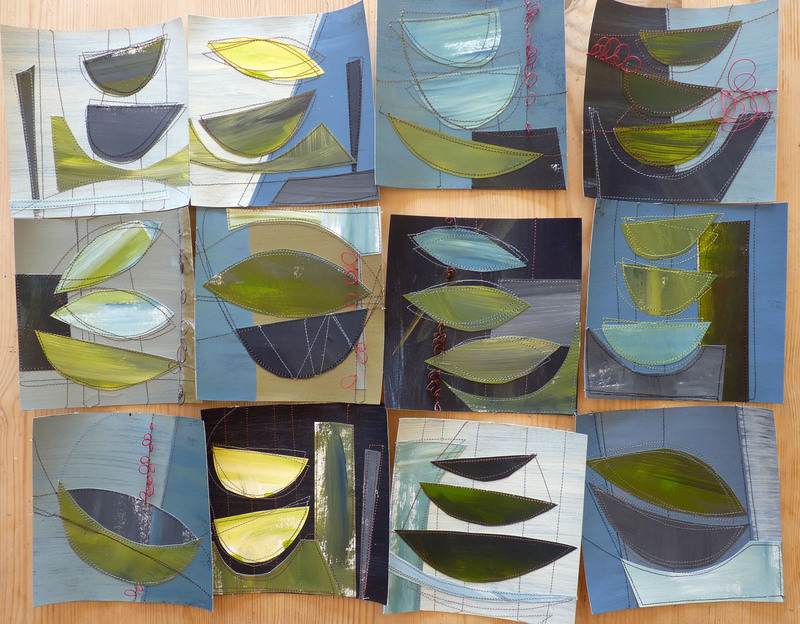 collages for an exhibition in the Autumn. This is an art show and I am doing it specifically to sell work. Shows like this provide me with the funding to buy materials (and time)to make and research the conceptual work that I find so interesting and enjoyable. 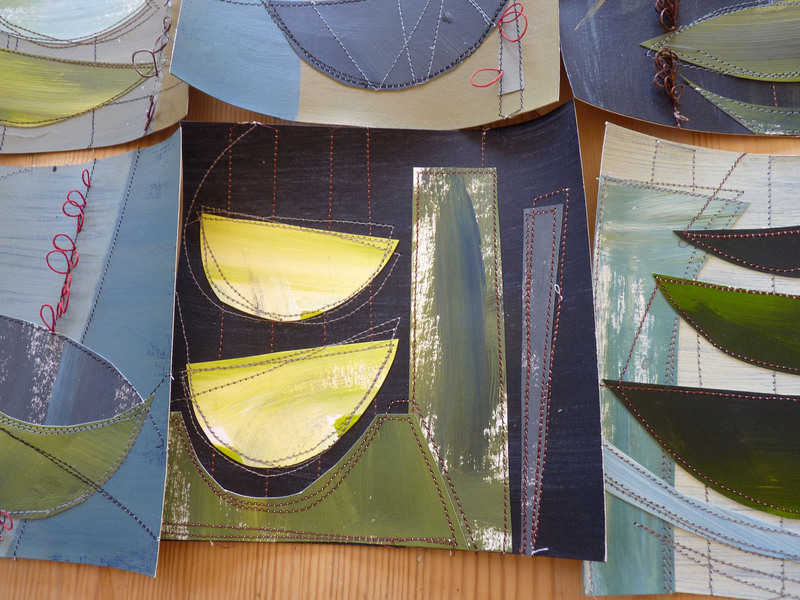 The collages are small, domestic pieces that are perfect for putting straight onto the wall. 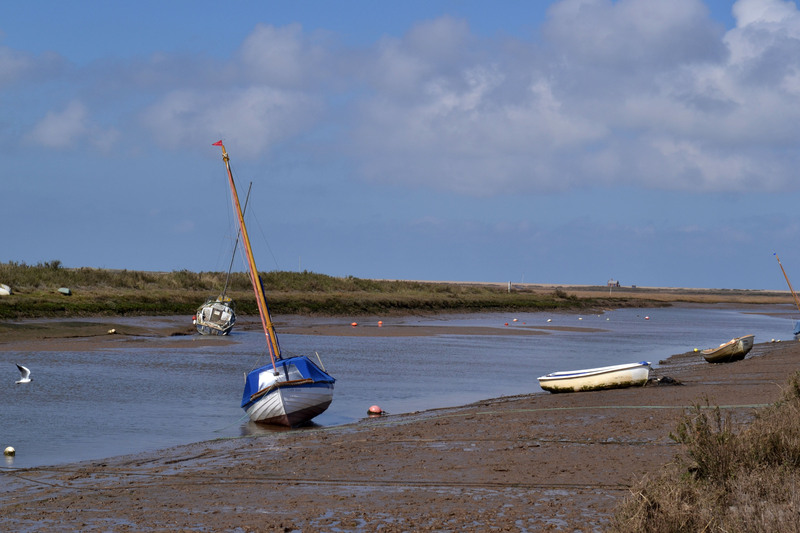 They give an impression of how I ‘see’ the coast. 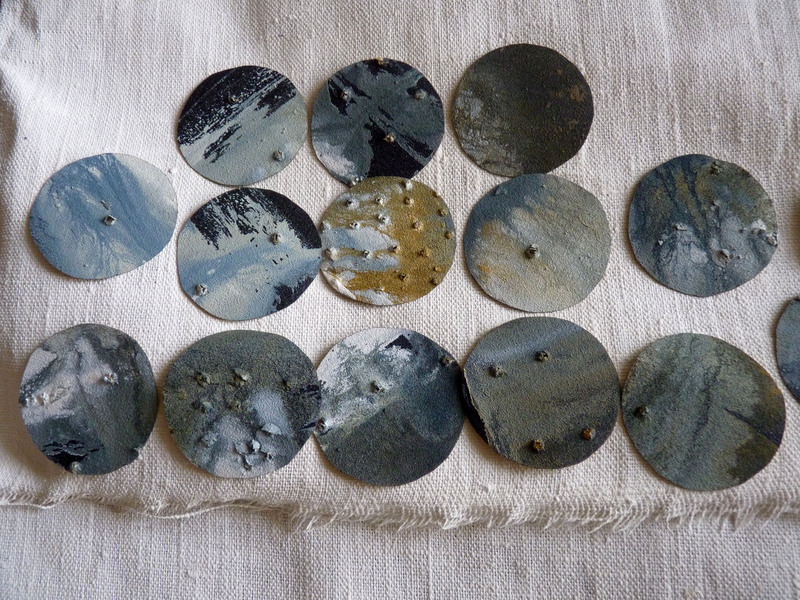 One batch is finished and ready to be mounted and bagged …. …. and they next lot (which are bigger) are on their way! Finally, you may have noticed that a lot of information has disappeared from the menu bar at the top of the page. This is because it has all moved over to my new website and you can now find my profile, galleries and exhibition details there. There is a link to it in the side bar or you can take a look here. This entry was posted in Uncategorized on July 2, 2014 by debbielyddon.